﻿Happy 100th Birthday to the National Park Service! Park Tables is celebrating the 100-year birthday of the National Park Service this August 25th! We are a proud member of the NRPA and have served many national, city, and state parks across the country. As a leading supplier of outdoor furniture to the parks and recreation industry, our mission is to provide excellent service to our local, state, and national parks. We have supplied outdoor site amenities such as picnic tables, benches, grills, and trash cans for parks of all sizes. We are proud to supply our parks with the best outdoor furnishings the industry has to offer. In celebration of the upcoming NPS Centennial, the National Park Foundation and the National Park Service announced the Find Your Park movement to help people connect with their local parks. You can get involved with your local park at FindYourPark.com. The celebration of the National Parks Centennial is not to just celebrate the last 100 years, but to inspire new generations to be active in their local parks for the next 100 years. In 2015, more than 75 million people visited the national parks across the country. The five most visited parks in ascending order are Yellowstone, Yosemite, Rocky Mountains, Grand Canyon, and Great Smoky Mountains. Here at Park Tables we have a personal history of enjoyment in our local and national parks just as many of our customers. The founder of Park Tables, John Gravlee, has visited many national parks across the country. Through his travels he has seen some of the most beautiful sights America has to offer, including Old Faithful in Yellow Stone Park, the North Window in Utah, as well as the Grand Canyon in Arizona. Our National Parks shelter the natural beauty and resources from industry encroachment. Americans can camp, hike, whitewater raft on the wild untamed rivers with minimal modern intrusions of buildings, roads, power lines, dams and asphalt. There is nothing like gathering family and friends around a campfire on a crisp evening with marsh mellows and ghost stories. The great variety and number of parks also provides every type of outdoor scenery from giant sequoias in California to sea oats by the ocean. You might find your fire in a Park Tables fire ring and enjoy your meal on one of our picnic tables! Be sure to leave the Park clean by disposing your trash in our tough commercial trash cans. The story begins with the first National Park, Yellowstone. The land that is now Yellowstone became the unincorporated community of Gardiner, Montana. 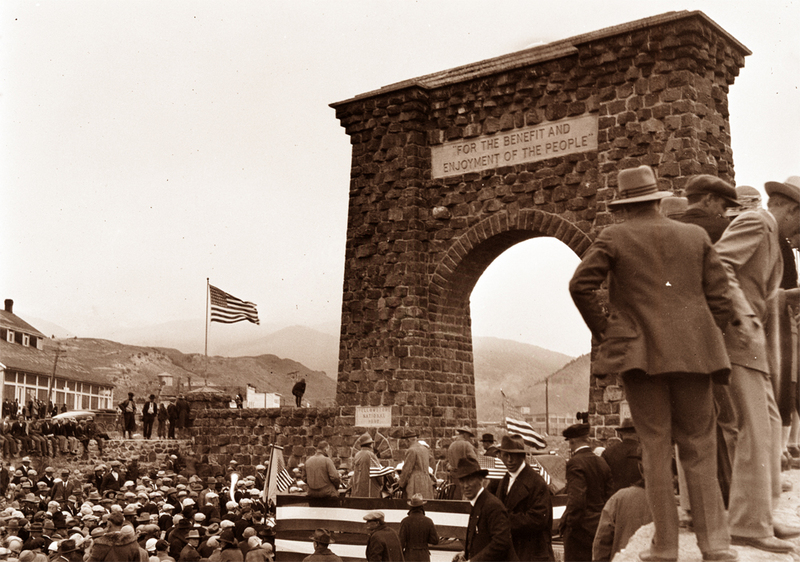 In 1903 Theodore Roosevelt visited Gardiner to dedicate the Roosevelt Arch, to cast the vision of the National Park Service into stone: "For the Benefit and Enjoyment of the People." On August 25, 1916, President Woodrow Wilson signed the act creating the National Park Service, a new federal bureau responsible for protecting national parks and monuments. Today it manages hundreds of parks as well as national monuments, preservations, and other protected sites. A hundred years ago, the Park Service was created with the mission of protecting and preserving some of the most wonderful sites in our country. The NPS now covers more than 84 million acres in 50 states, the District of Columbia, American Samoa, Guam, Puerto Rico, Saipan, and the Virgin Islands. By the protection of the NPS, the rich history and culture of our country has been protected so every generation has the opportunity to experience the natural wonders of our country. Please take a moment to browse the NPS official site and view the rich history it has to offer.